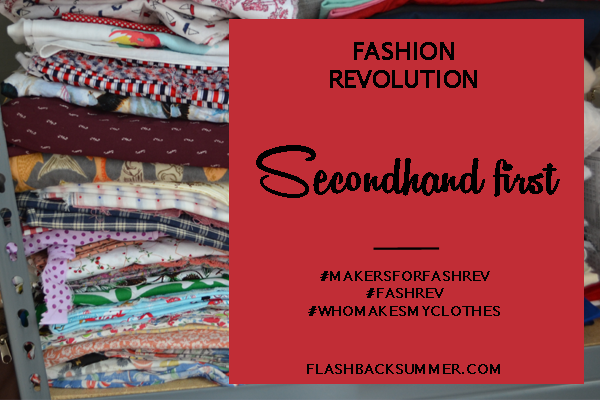 Today's Fashion Revolution theme is "secondhand first," and I don't need to tell you vintage lovers much about that! Most of us realize the beauty of buying "secondhand" items, especially if they happen to be midcentury or before! One of the reasons I love vintage is that it's not even like other secondhand purchases from thrift stores or charity shops. It's generally higher quality and much of it gains value over time instead of losing it. It's collectible and it's historical... and it's fabulous! 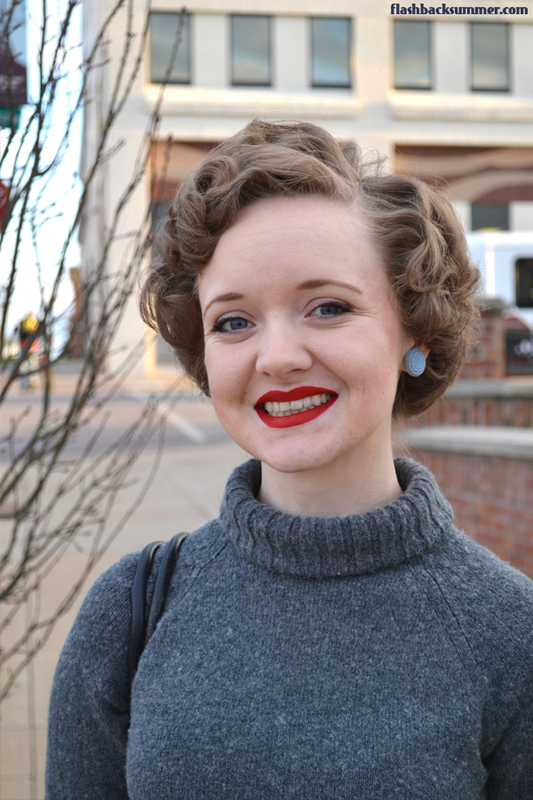 The vintage community, obviously, lives out the "secondhand first" idea extremely well. It's what makes us the vintage community! Another thing that I want to do better in, however, is in buying secondhand fabrics and newer secondhand clothing for sewing projects if at all possible. 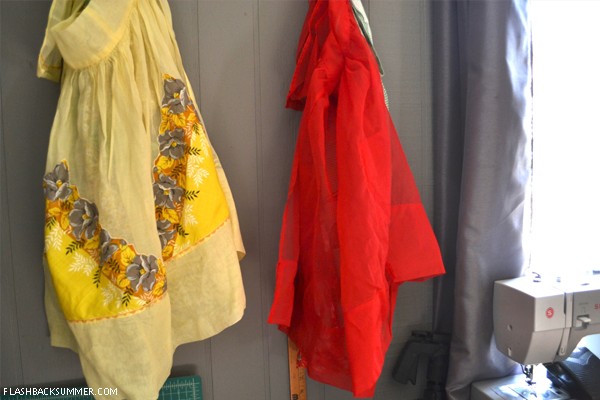 Though I don't generally buy clothing from thrift stores very often, they are wonderful places to find clothing to create into something new, sewing notions, and fabric. My wedding suit was made of mystery fabric from a thrift store, as well as many of my old college dorm accessories. Now that I think of it... my wedding dress and veil were also "secondhand" vintage! I actually prefer buying notions, especially zippers and buttons, secondhand if at all possible. Zippers tend to be especially cost-effective this way, and oftentimes I get vintage metal zippers that hold up for longer! Not to mention, vintage buttons are far superior in design and look to most modern buttons, in my opinion. Quite honestly, I don't feel the need to write a very lengthy post, because this is something you are likely extremely good at already! You see the value; you get it! What are some of your favorite items to buy secondhand? Are there any items you would like to be more diligent in checking for a secondhand version before buying new? 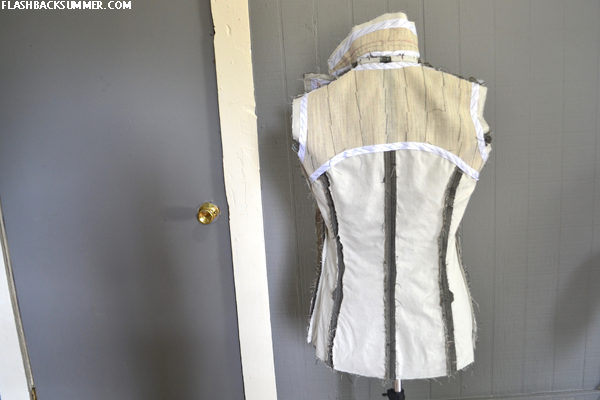 Oh, upcycling! 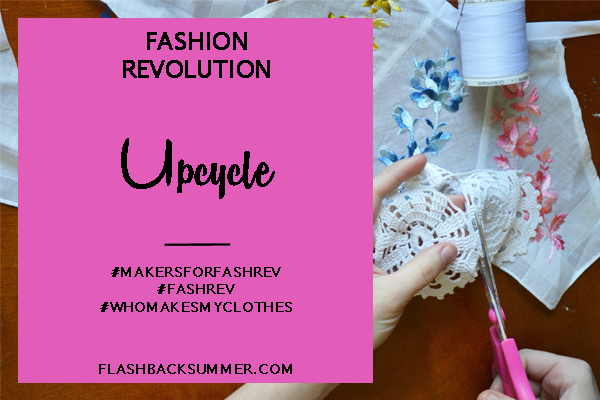 That is today's Makers for Fashion Revolution Week, and of course it's one near and dear to my 1940s-loving heart! 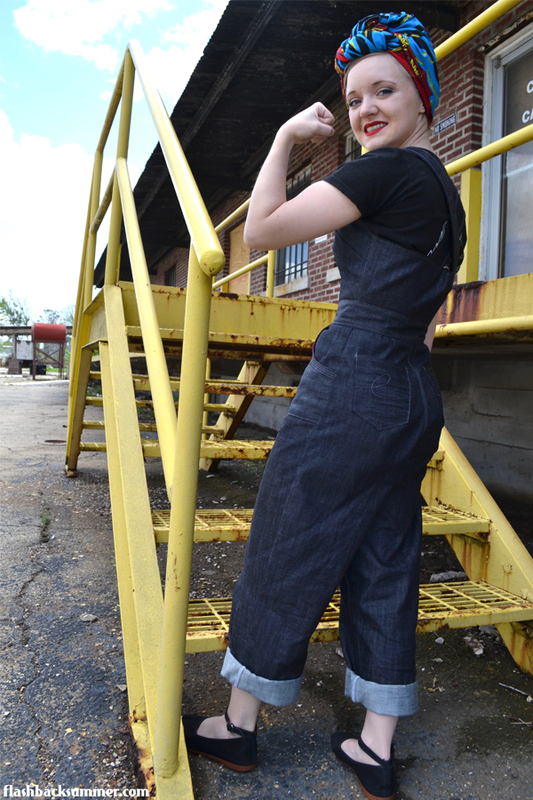 We vintage wearers know, of course, that upcycling is just the modern term for "make do and mend." 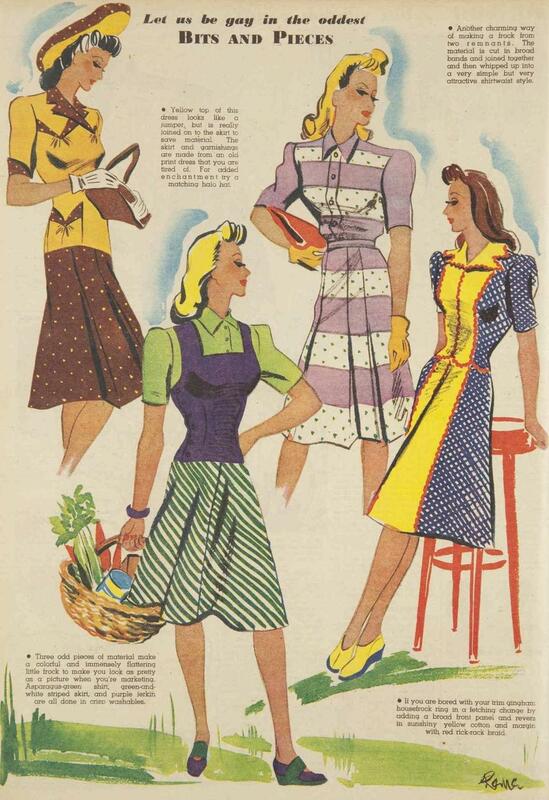 Ladies of yesteryear were creating new fashions out of old ones long before it was a trendy thing to do. They did it out of necessity and practicality. I also have these photos of a jabot I made out of old hankies. I'm still working on an outfit to style it with! 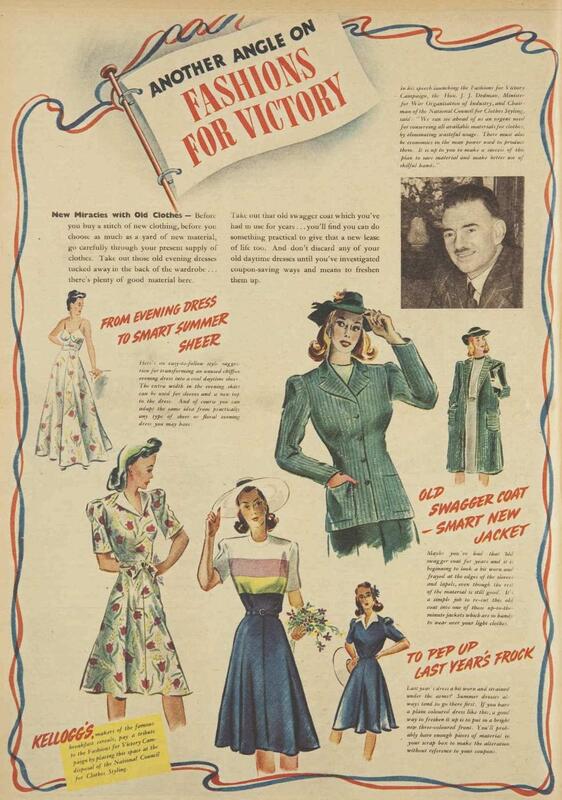 "Grand Ways to Eke Out Dated or Worn Clothes"
"Another Angle on Fashions for Victory"
For myself, my main action step for this year is to give newer second-hand clothes a shot to be refashioned. You know, the ugly 80s and 90s garments that are unlikely to come back into vogue ever again and are probably destined for a landfill without a refashion. They're relatively inexpensive, and it would be a great way to cut down on clothing being thrown away. 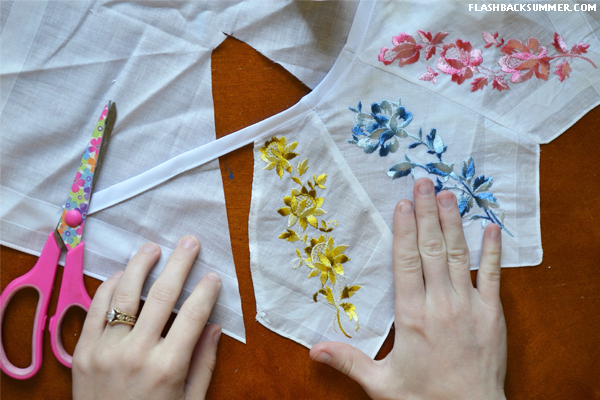 Do you have any favorite makeovers that you've done for old garments? 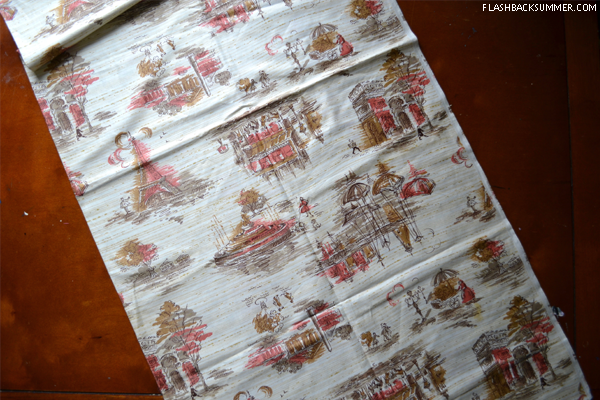 Are there any vintage make do and mend resources that you love? Not many people know how to mend nowadays! 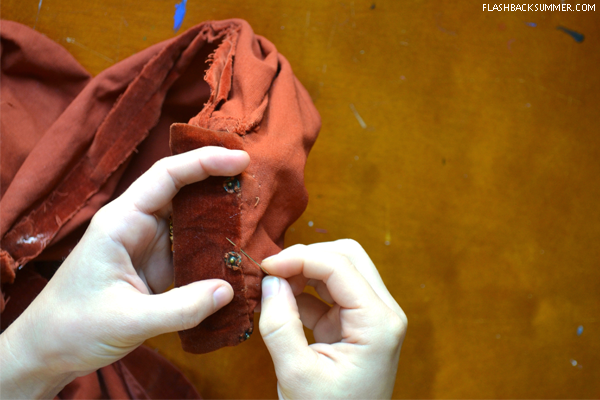 While people of yesteryear always mended their clothing ("make do and mend" was a real thing! 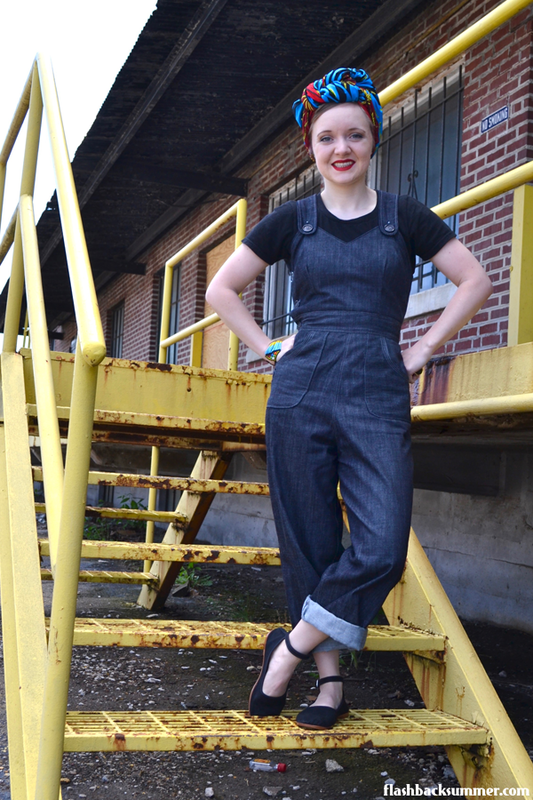 ), I can honestly say I never thought to mend clothing until I wore vintage. If a shirt got a hole in it when I was younger, I figured it was ruined and usually threw it out. No longer! 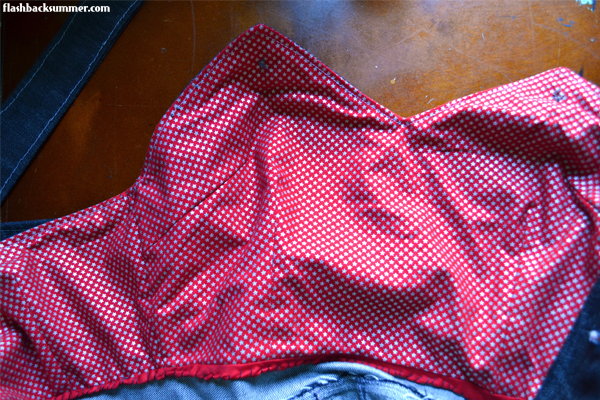 Fixing garments, I've found, is a unique skill. It's not exactly the same as sewing a garment. It takes some ingenuity and creativity! 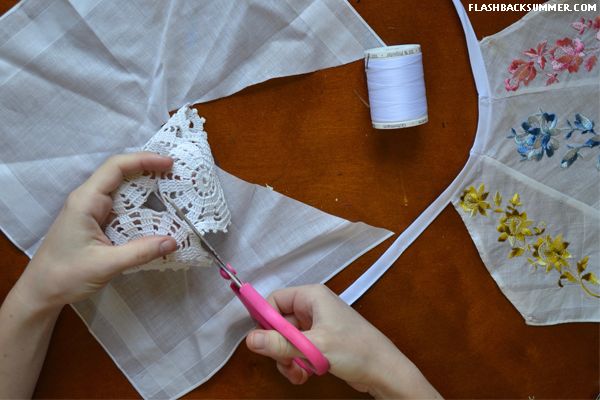 "How to Mend After Moth"
How do you guys feel about mending? 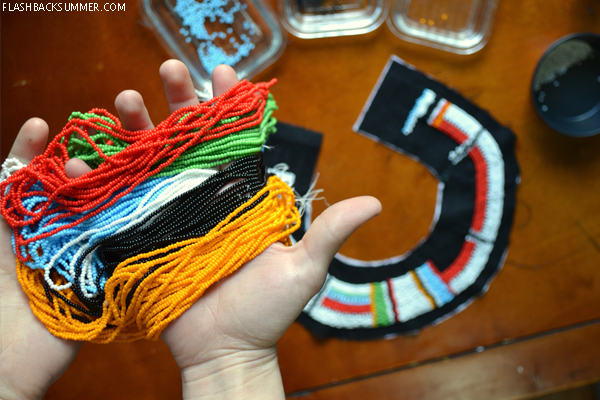 Have you learned any useful tips or have any favorite mending resources? This is the week dedicated to looking specifically at the issues plaguing the clothing industry and how we as everyday Janes and Joes can go about changing things for the better. 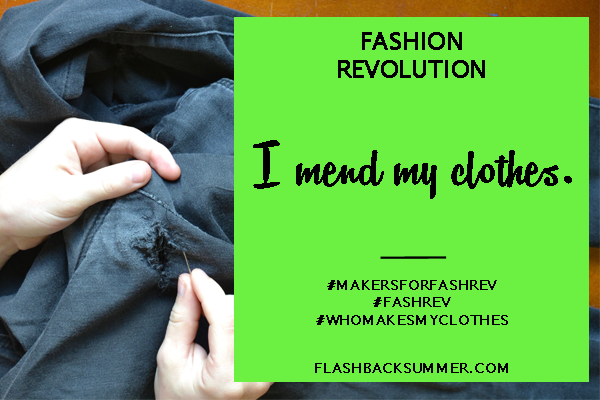 The week is hosted by Fashion Revolution, a non-profit organization created in the wake of the 2013 Rana Plaza Complex collapse that killed over 1,100 garment industry workers and injured over 2,500. This event awakened many of us in the world to the reality of abuse and greed in the clothing supply chain, and we began looking at the brands we love, the factories that produce clothing, and our own habits to see how we can make things better. 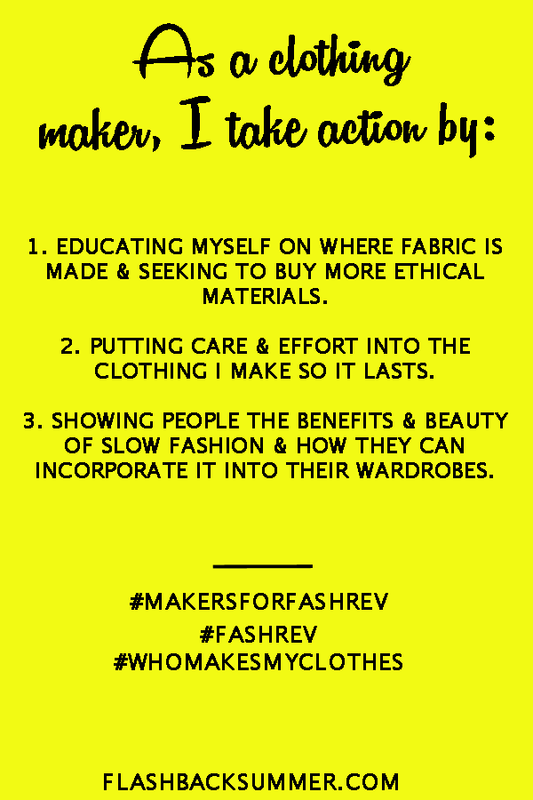 But some of you may be like me... Mostly, you make your clothes. You buy vintage. You make do and mend. 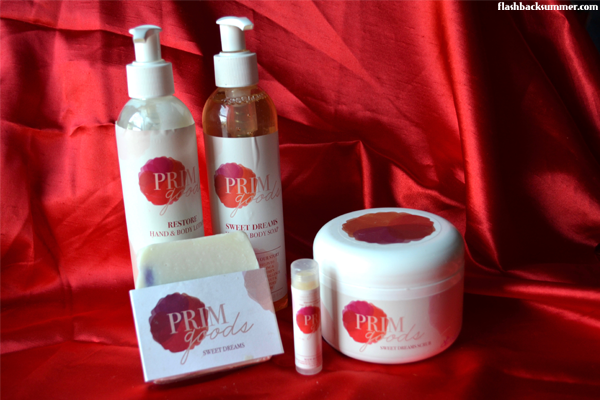 You're already doing many of the things that are recommended for revolutionizing the industry. But that doesn't mean we're off the hook! We can do better, and we can help others do better! 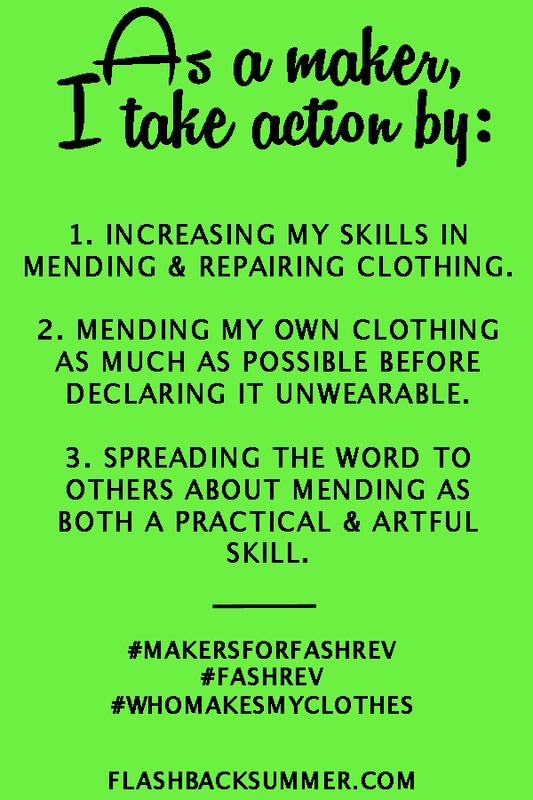 I'm pleased to say that In the Folds and Petit à Petit already thought of this, and this week they're coming at this fashion revolution from a maker's viewpoint. 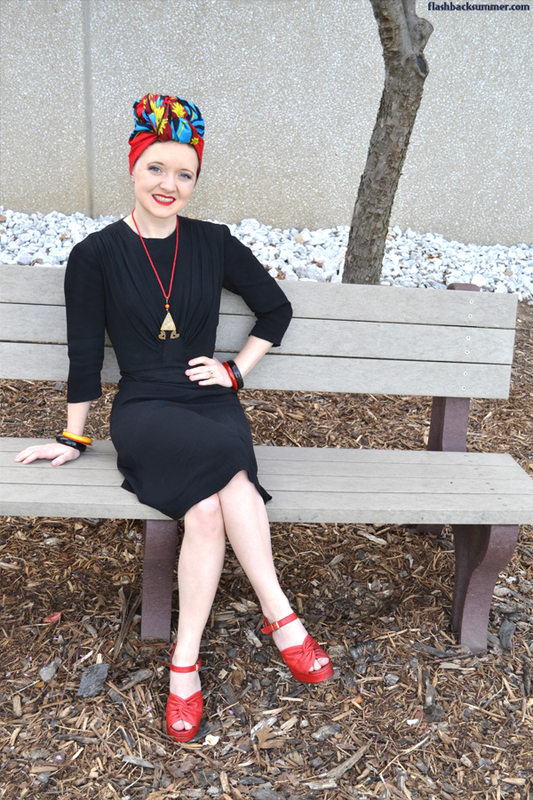 I'm joining in and will be posting on IG and on the blog this week on the issue, and I'll be adding in a vintage-wearer's two cents while I'm at it! Although not all of you are sewists, I know that many of you do identify. 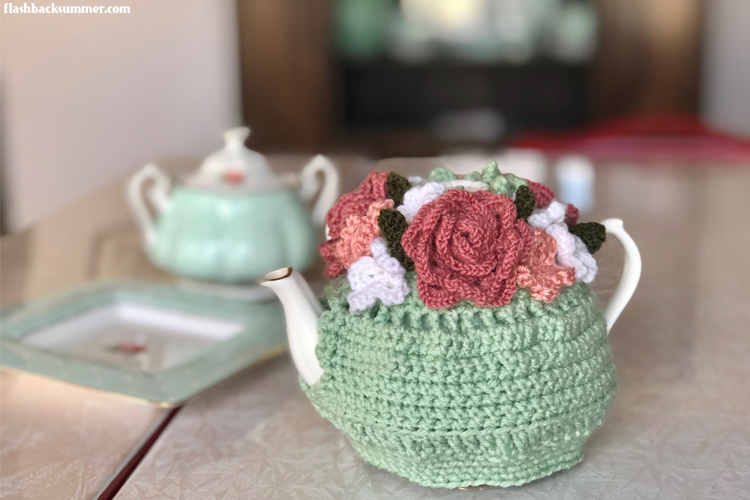 You may also be a crocheter, knitter, weaver, milliner, etc. There are many ways to make clothes! 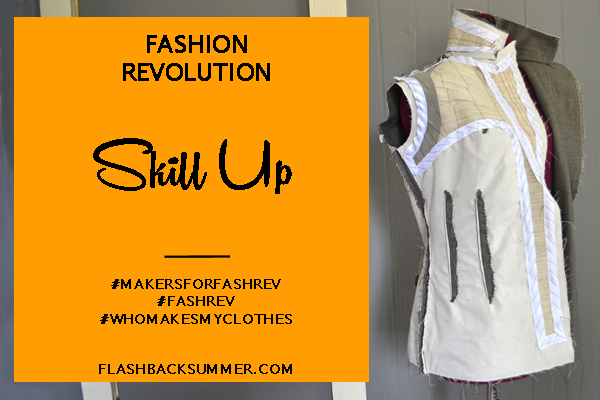 Whether you have made all of your wardrobe or just a few accessories, making your own clothing is an amazing way to revolutionize the fashion industry. Sewing has allowed me to rebel against the standardized sizing of fashion in the U.S. that doesn't generally fit me as a petite woman. 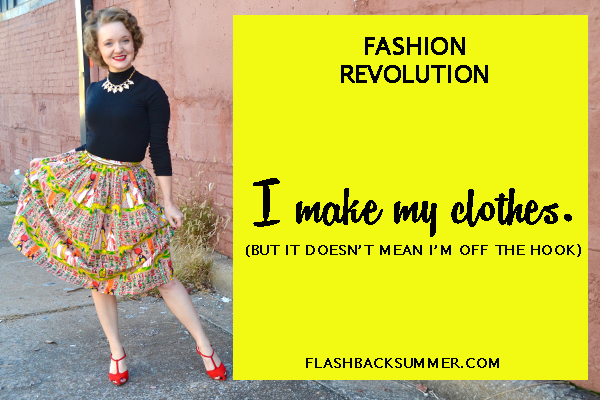 It has also given me the freedom to wear what I want instead of having to choose from what is available. 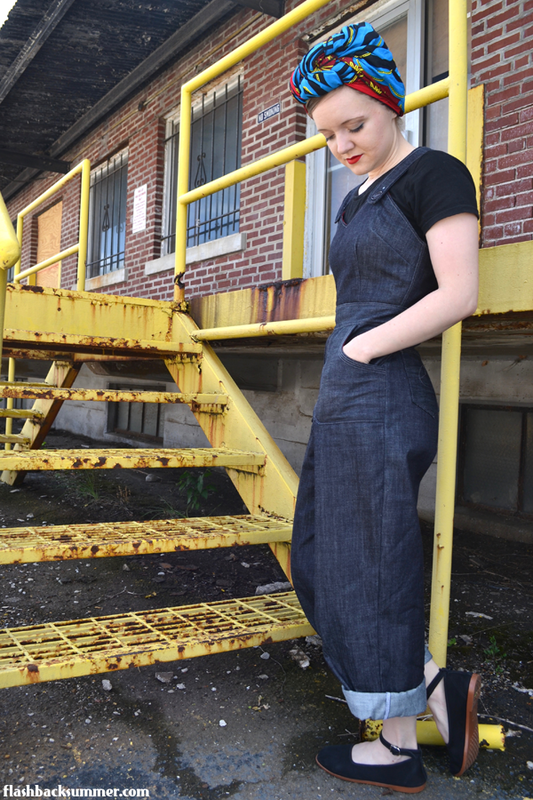 It also makes the vintage styles I love more affordable and durable, rather than buying original vintage all the time. 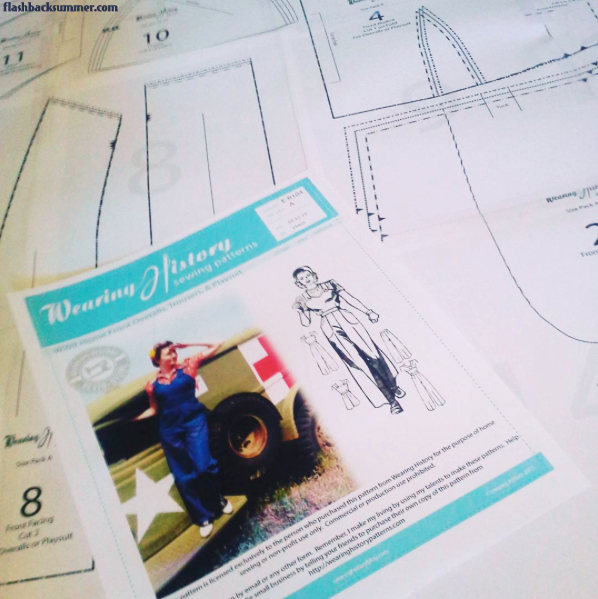 Making my own clothing is just the best! 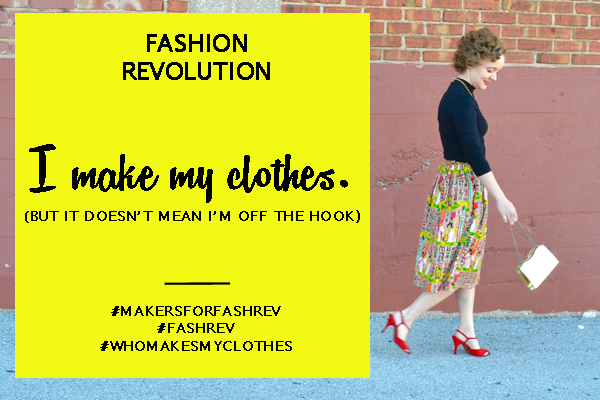 However, making my own clothing doesn't let me off the hook when it comes to revolutionizing the garment industry. I do still buy some things off the rack. Socks, t-shirts, and underwear especially. Not to mention, I also use fabric made in factories. Just because I step into the clothing production chain at a sooner point than others doesn't mean I don't play a part in it. So, as a maker, I still have a responsibility in this cause. 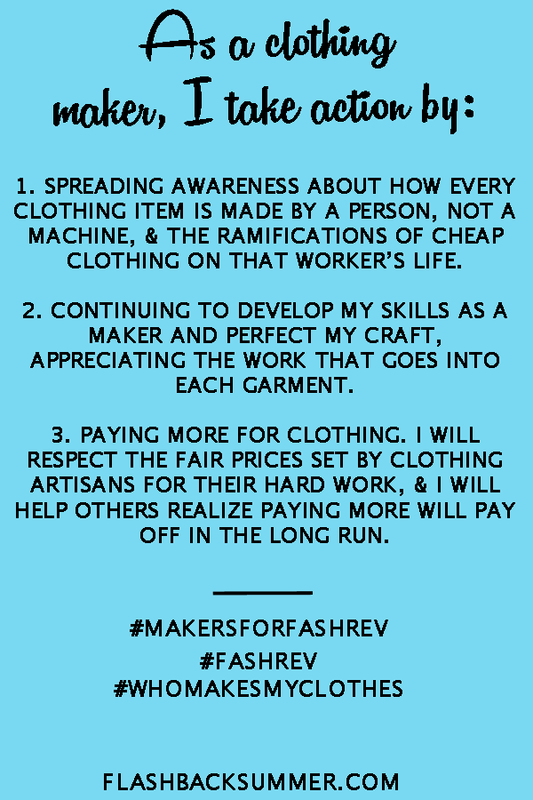 Here are my personal three action steps relating to my role as a clothing maker. 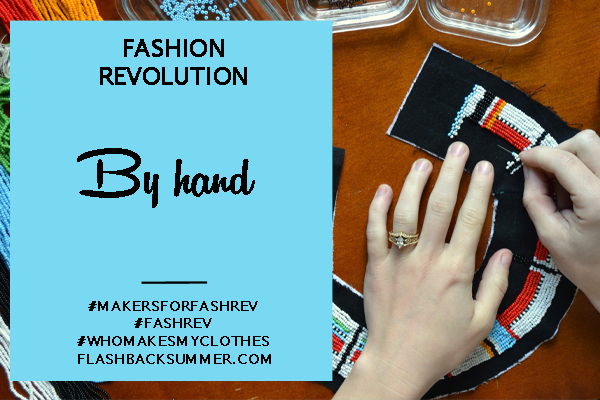 What are your thoughts on this Fashion Revolution Week? 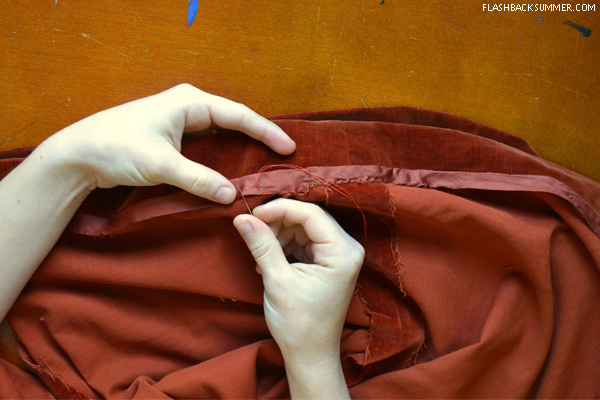 If you are a clothing maker, how can you still impact change in the clothing industry? 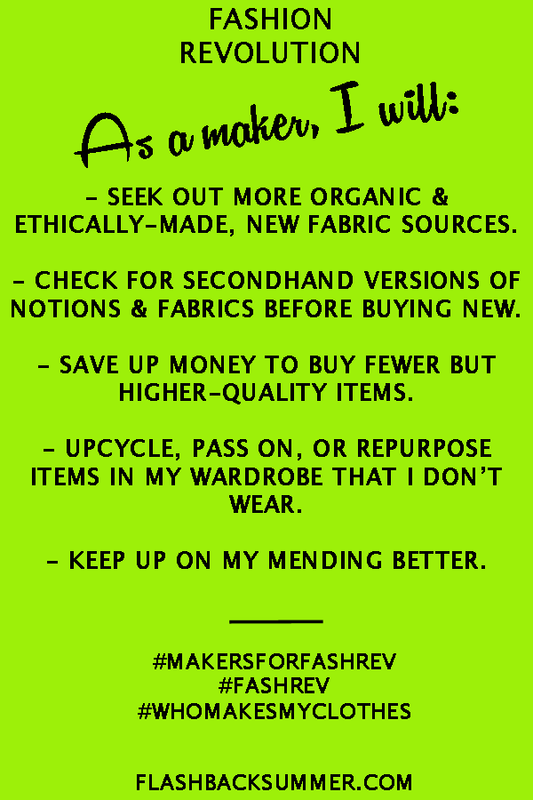 Do you have any sources of secondhand or ethically made fabric you especially love? 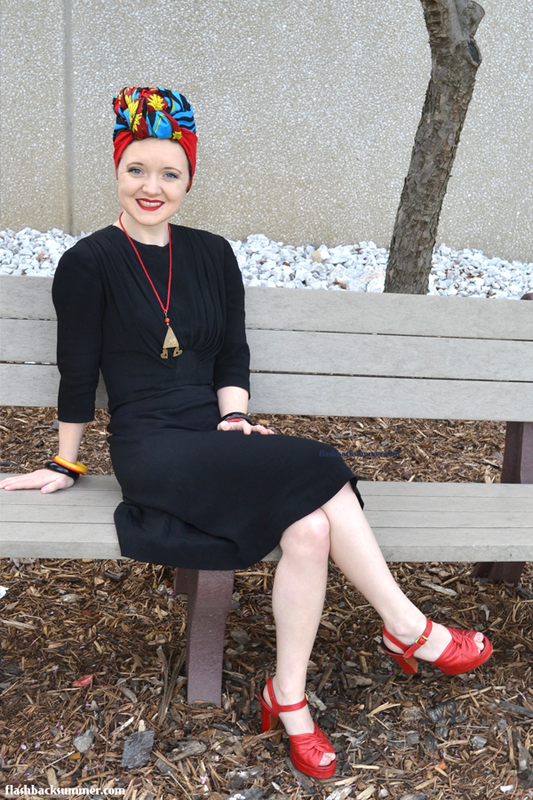 I've been loving our discussions about head wraps and learning about others' styles, and today I'm sharing with you guys a wrap-leap I've taken for my own style: I bought my first West African style head wrap! 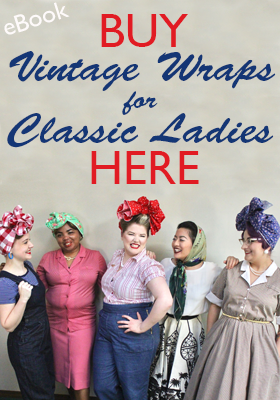 I found out about The Wrap Life shop through some vintage friends, and it came highly recommended. After freaking out over the gorgeousness of their IG feed and website for an embarrassingly long time, I decided it would be worth the money to try out one of their beautiful wraps. I ended up buying the Yendi wrap, and it shipped quickly from their store in New York. 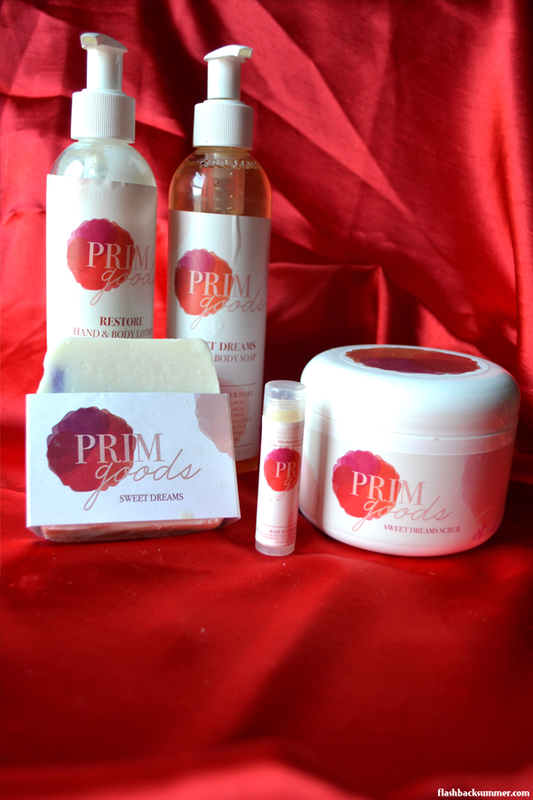 When it arrived and I opened it... SWOON, the packaging made me melt! Exquisite photos and encouraging messaging that, needless to say, is not the type of packaging you immediately throw away. These suckers are hanging in my sewing room because they are just too darn pretty! I'll be honest with you guys, I've never bought an African head wrap because I personally felt weird about it. 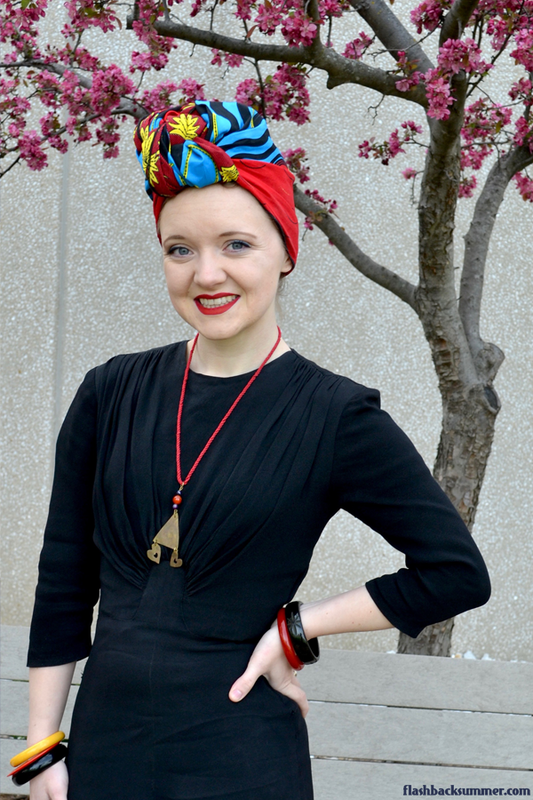 I knew that giant head wraps are things specific to certain tribal groups, such as the gele in Nigeria, and I didn't feel comfortable sporting an item from a culture I really don't have a connection to. I lived on the opposite side of Africa, and though they get lumped together a lot... the cultures across the continent are really quite different from each other. Where I lived, head wraps were worn in an Islamic context and looked nothing like these. However, the more I've learned about these styles of wraps, the more I've been able to distinguish between tribal-specific styles and prints and wraps that are more "generic" and worn by many African peoples. I took the leap with this more generic print. It took me many video tutorial views and much wrapping practice to even get to this point, ha! Like I said, most of my experience with head wrapping stems from either vintage or more Islamic styles, neither of which use long, stiff, rectangular scarves like these. 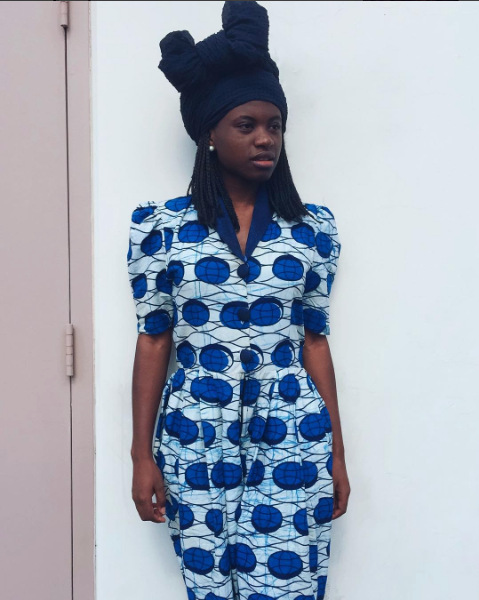 Also, Islamic styles tend to utilize straight pins more often to achieve pretty tucks, folds, and shapes, while these more West African style wraps achieve a secure fit through tucking and sometimes knots. Major learning curve! For me, when it comes to styling an African wrap, I will probably not wear an African wrap with an African garment at the same time, even if it's one I've made. It's not a decision that I make on moral grounds or anything; it's just my personal stance (barring, of course, cultural occasions like weddings where full garb may be appropriate). While I have ties to Africa and lived there (albeit in East Africa) for a couple years, the combination of both an African head wrap and an African garment feels too African for me. While my life experience has twinges of Africa, I am not ethnically African, nor did I grow up there. 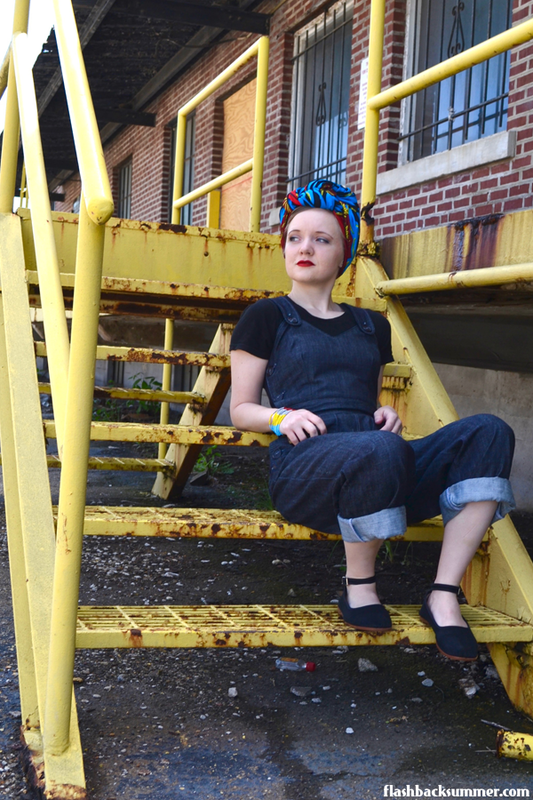 I want my style to reflect who I am, and putting on too much Africa all at once feels contrived and inauthentic to me. 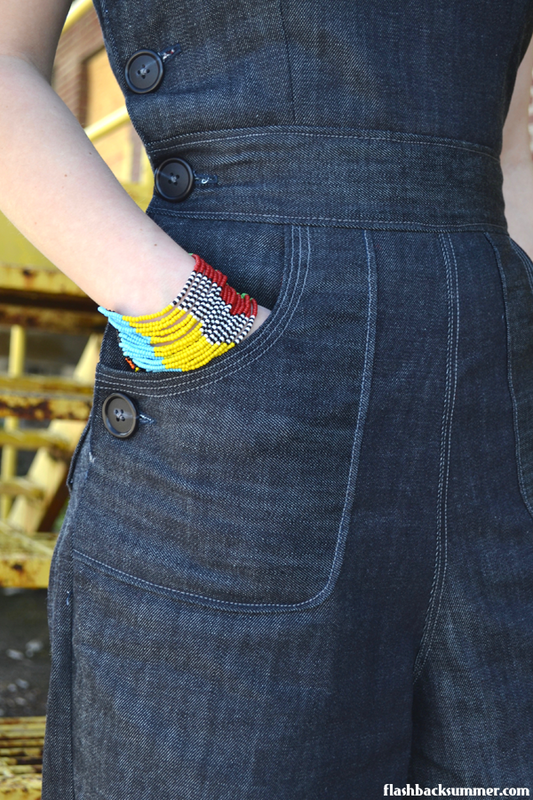 Who I am has twinges of Africa, so my wardrobe does, too. 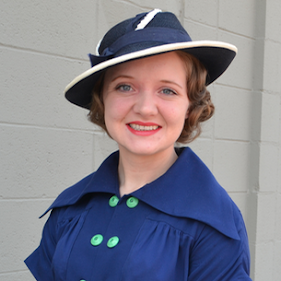 Thus, I paired the wrap with a 1930s/40s dress and 1940s heels, bakelite, blue eyeliner (also a first!) and a necklace from my part of Africa. It's Nubian, and in Nubian art triangles represent your heritage and the past. This necklace says that I am proud of where I've been and the people who have made me who I am. It's a little African, it's a little vintage, and it's all me. Have any of you bought a wrap from The Wrap Life? What's your favorite wrap in their store right now? Who Can Clap for that Wrap? This post is not affiliated with The Wrap Life in any way and is not a sponsored post. All opinions expressed are honest and my own. Oh, novelty prints. They are the crowning jewel of vintage in many's opinion, and I am also a fan. However, novelty prints throw off my wardrobing plans. I have this underlying plan of curating my wardrobe over time to be certain colors, styles, and looks that can all mix and match. However... this novelty print will be the odd man out in the closet. I bought this fabric because of the Middle Eastern type print of turbaned men on horseback hunting deer, and it's just too good! However, the colors are what have thrown me off as far as styling goes. I wondered for a long time what to make out of the fabric, and I finally settled on a gathered skirt because it's simple to make and wear and easy to mix with other pieces. HOWEVER, the ease of mixing really only applies if you have anything else in your wardrobe that is any one of the colors in the print. 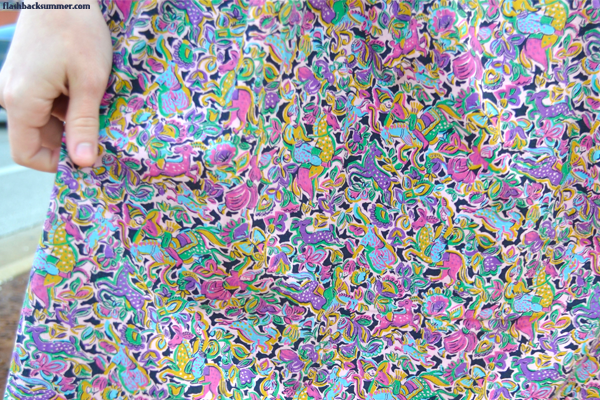 This print has purple, kelly green, sky blue, chartreuse, and pink... all colors I have exactly none of in my wardrobe. Anyone else have orphan garments that match nothing else in your wardrobe? Do you get rid of them or find a way to make them work? Which countries have you lived in, and which country (or countries) does your family tree hail from? I have lived in Nigeria, Canada, and the United States but my family’s roots are in Nigeria. 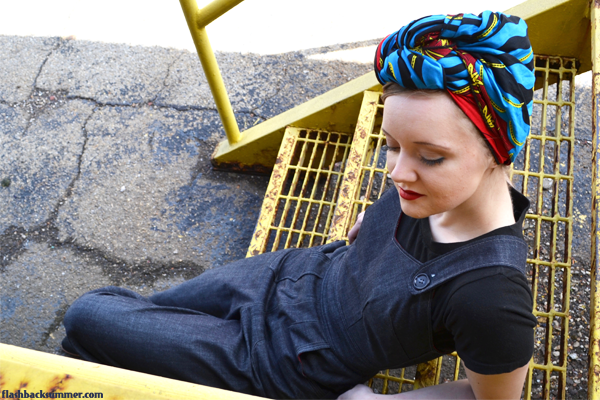 How often do you wear head wraps? It depends on the hairstyle. When I am wearing my afro out or a short braided style, I wear them more often (2 times or more per week). I think I do this because it sits on my head more easily. But my hair is currently in long, thick twists so I haven’t worn a head wrap in months. 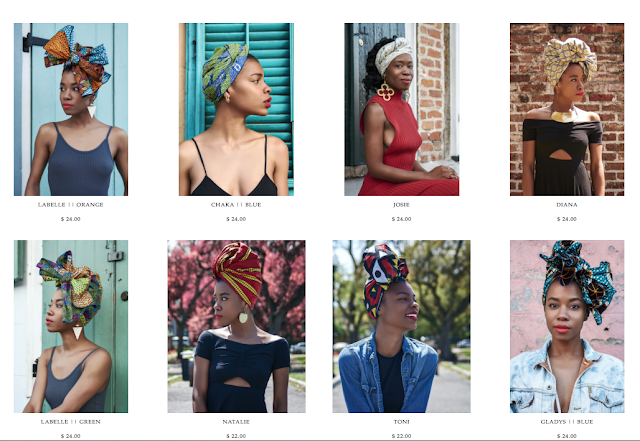 What significance do head wraps have to you? Do you wear them for utilitarian reasons and/or cultural reasons? Oh, it’s both utilitarian and cultural for me. 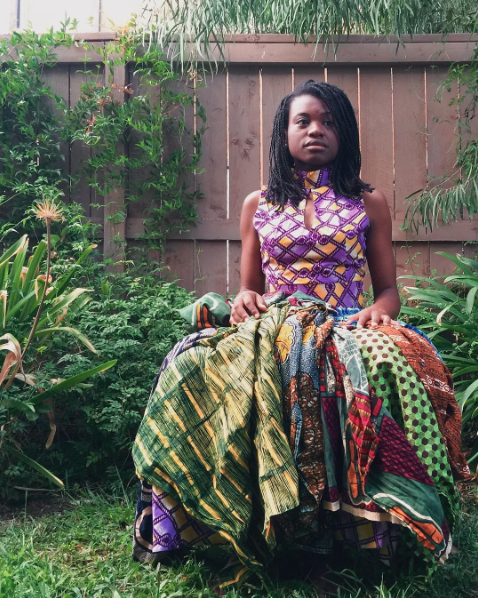 When you spend so much of your childhood ashamed of your African identity due to being picked on about it, it empowering to sport your African fabrics as an adult who is extremely proud of her heritage. 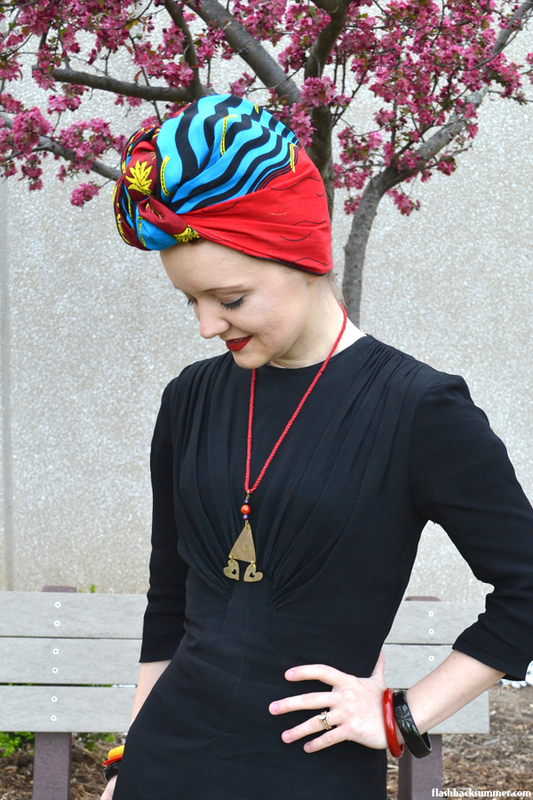 I am more drawn to neutral tones in clothing but a vibrant headscarf can be a wonderful icing on the cake on a more “quiet” outfit. 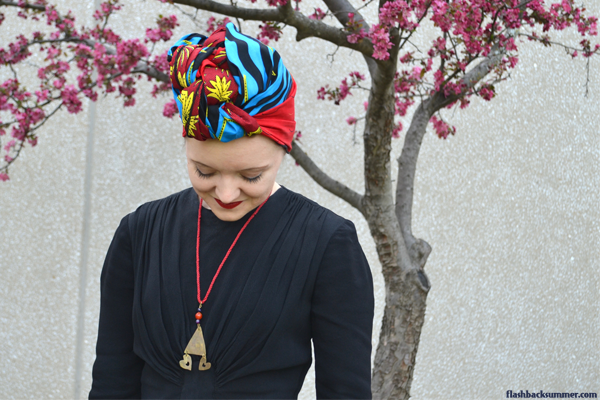 Headscarves and head wraps are also cleverly beautiful ways to hide my bath hair days. 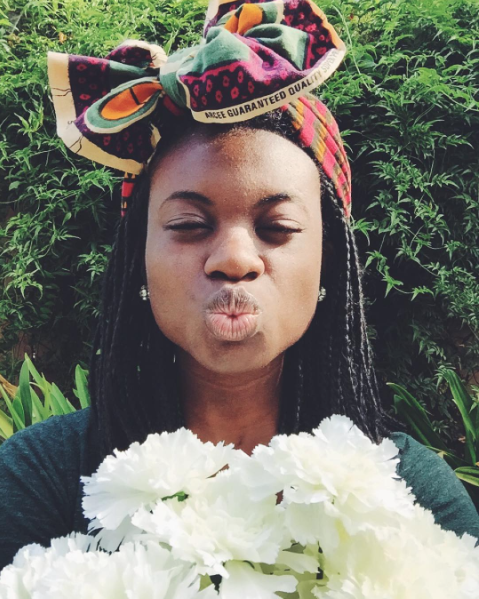 What makes a head wrap particularly Nigerian/African/West African? The fabric used and the way it is worn can play into whether or not a head wrap style is authentically African. Sub-saharan African print is quite distinct to me. 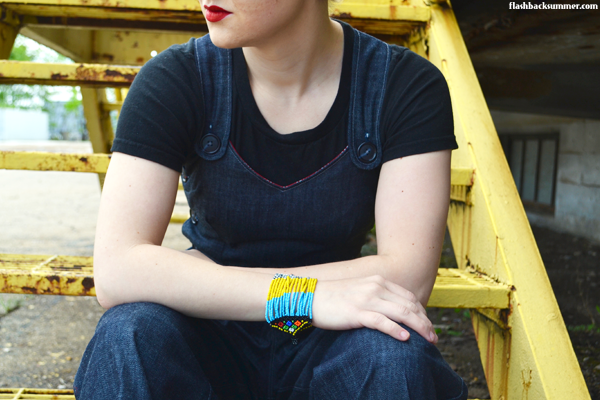 There are some widely known prints like Kente cloth from Ghana and Ankara from Nigeria. Both are known for their vibrancy in color. The Kente cloth alternates between two types of fabric per row, often using yellow and other bright colors and patterns. Ankara is a bit harder to explain because there are nearly countless variations of the print. But the feel of them are the same: colorful yet not overbearing. There is one head wrap common in Nigeria called a Gele. 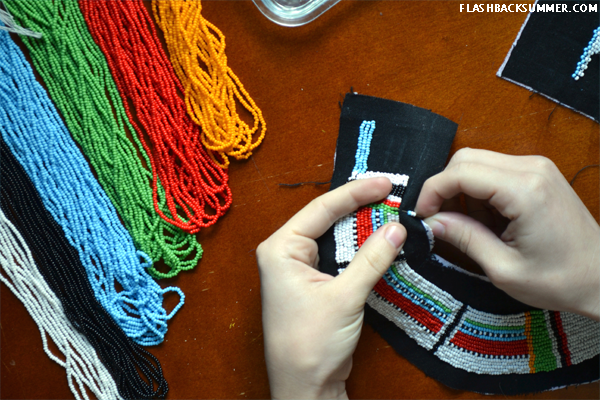 It is worn by women only during special occasions like weddings and other major celebrations and ceremonies. The fabric used for the Gele is usually ornate and quite firm, allowing the wearer to pin and manipulate the fabric to her liking. It is so gorgeous and it kind of reminds me of a rose. Are there any ways that non-Africans/Nigerians/West Africans can take inspiration from your culture’s head wrap styles without stealing them? One thing Westerners and Western culture can do is stop acting like they found a novel fashion piece whenever they are rocking African items, head wrap or otherwise. It happens so often and is so offensive. Arbitrary “tribal print” headscarves and clothing sold in stores like Forever 21 sometimes have them with patterns that are African and, of course, Africa is not given the due credit when it is advertised. It’s just a cool “new” trend. Knowing the history of the continent and how it has been (and continues to be) pillaged and colonized, the very least they can do is acknowledge and respect the origin of those fabrics and buy from African designers. At the end of the day, people are going to do what they want to do, but I would prefer that non-African people wear African fabrics for reasons other than “it looks cool.” That will challenge people to actually research the history of what they are wearing, perhaps even to the point that they would rather not wear it out of respect. 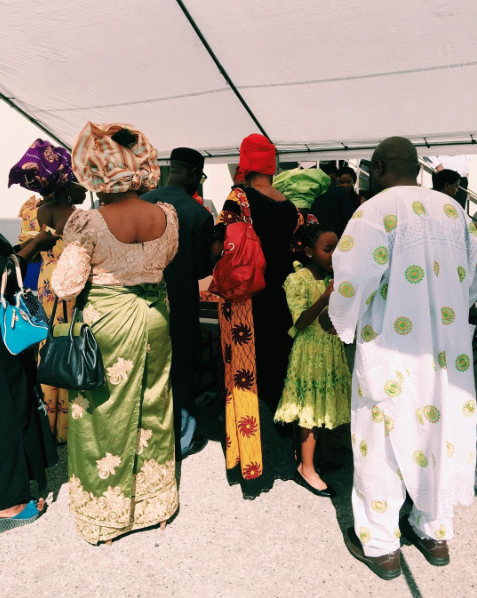 When in doubt, my advice is to wear the fabric if you’re invited by someone in the culture to do so (wedding, etc.). Have you learned something new in this interview with Mary? Does her insight change or affect your own personal wrap style? 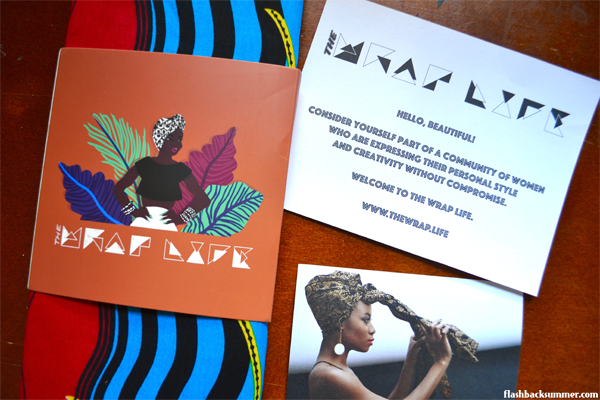 If you would like to share your wrap style in the Clap for That Wrap series, just shoot me an email! I'd love to hear from you!